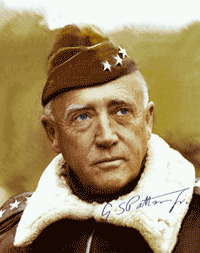 General George Smith Patton Jr. was a senior officer of the United States Army who commanded the U.S. 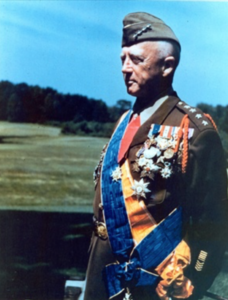 Seventh Army in the Mediterranean theater of World War II, and is best known for his leadership of the U.S. Third Army in France and Germany following the Allied invasion of Normandy in June 1944. Possessing excellent fencing and horsemanship skills, Patton was selected for the 1912 U.S. Olympic team for the first ever Olympic modern pentathlon event, held in Stockholm, Sweden. The new event was created to test military men in five sports challenges: fencing, swimming, shooting, equestrian jumping and running. Patton finished a respectable fifth place overall, but a disappointing shooting performance cost him a chance at a medal. Young Patton first saw combat during the Pancho Villa Expedition in 1916, taking part in America’s first military action using motor vehicles. It was a U.S. Army operation against the paramilitary forces of Mexican revolutionary Francisco “Pancho” Villa during the Mexican Revolution of 1910–1920. He later joined the newly formed United States Tank Corps of the American Expeditionary Forces and saw action in World War I, commanding the U.S. tank school in France before being wounded while leading tanks into combat near the end of the war. Patton remained a central figure in the development of armored warfare doctrine in the U.S. Army, serving in numerous staff positions throughout the country. Rising through the ranks, he commanded the 2nd Armored Division at the time of the American entry into World War II. 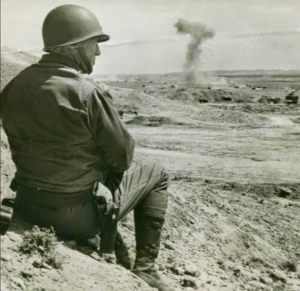 Patton led U.S. troops into the Mediterranean theater with an invasion of Casablanca during Operation Torch in 1942, where he later established himself as an effective commander through his rapid rehabilitation of the demoralized U.S. II Corps. He commanded the U.S. Seventh Army during the Allied invasion of Sicily, where he was the first Allied commander to reach Messina. There, he became embroiled in controversy after slapping two shell-shocked soldiers under his command, and was temporarily removed from battlefield command for other duties such as participating in Operation Fortitude’s disinformation campaign for Operation Overlord. Patton returned to command the Third Army following the invasion of Normandy in June 1944, where he led a highly successful rapid armored drive across France–earning his second star. He led the relief of beleaguered American troops at Bastogne during the Battle of the Bulge, and advanced his Third Army into Nazi Germany by the end of WWII. 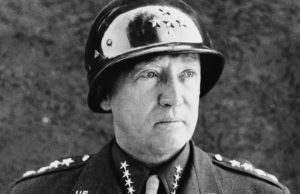 Patton earned his third star in what British Prime Minister Sir Winston Churchill declared, “Undoubtedly the greatest American battle of the war and will, I believe, be regarded as an ever-famous American victory.” In terms of participation and losses, the Battle of the Bulge is arguably the greatest battle in American military history. Patton was awarded his fourth star on April 14, 1945. After the war, Patton became the military governor of Bavaria, but he was relieved of this post because of his statements trivializing denazification. He commanded the United States Fifteenth Army for slightly more than two months. 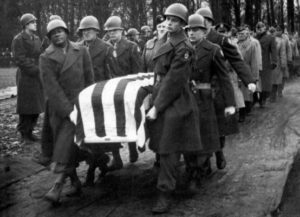 Patton died in Germany on December 21, 1945, as a result of injuries from an automobile accident twelve days earlier. Patton’s colorful image, hard-driving personality and success as a commander were at times overshadowed by controversial public statements. His philosophy of leading from the front, and his ability to inspire troops with vulgarity-ridden speeches, attracted favorable attention. And his strong emphasis on rapid and aggressive offensive action proved effective. While Allied leaders held sharply differing opinions on Patton, he was highly regarded by his opponents in the German High Command. A popular, award-winning biographical film released in 1970 helped transform Patton into an American folk hero.